The violence at Tuesday's match between West Ham and Millwall was a "disgrace to football", the sports minister says. Gerry Sutcliffe said: "We have made great progress in tackling hooliganism in this country and will not tolerate a return to the dark days of the 80s." 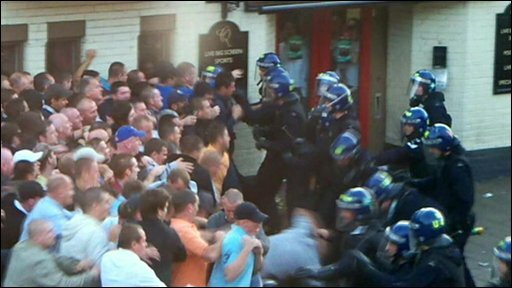 Investigations are being held into the fighting involving hundreds of fans that marred the Carling Cup game. A 44-year-old man is stable in hospital after being stabbed in the chest. Police said 13 people were arrested. West Ham and Millwall fans have been involved in rivalry going back decades. Mr Sutcliffe continued: "I completely back the FA's call for any person identified as involved to be banned for life. "The scenes last night were a disgrace to football." Justice Secretary Jack Straw said the FA needed to take "strong measures" to prevent a repeat. And Home Secretary Alan Johnson said: "Anyone who thinks thuggery has a place in modern-day football is living in the dark ages, and will bring only shame upon the teams they support. "We have very tough football legislation in place and are confident that the police will ensure offenders are brought to justice." Jeremy Hunt, shadow culture secretary, said: "Wider questions need to be answered as to how the situation was allowed to get out of hand in the first place." 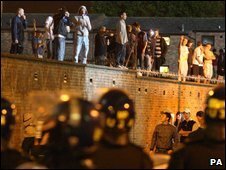 Fights thought to have been planned started near the east London stadium at about 1800 BST and continued for five hours. About 200 riot police with at least 20 mounted officers were at the scene. One pub reportedly had its windows broken as running battles continued across several streets up to half-a-mile from the stadium. Eyewitnesses said hooligans ripped out bollards and lit fires. By 2300 BST several hundred West Ham fans had congregated outside the stadium where they chanted and bombarded police with beer cans and bottles. Officers are scanning video to identify hooligans. Inside the stadium the pitch was invaded on three occasions. West Ham won the game 3-1. Andy Holt, the Association of Chief Police Officers' football policing expert, said: "Last night is an unwelcome reminder of violence once commonplace at grounds. "Football hooliganism is still a lingering menace, albeit among a small minority of supporters and we will not tolerate it. "Over 20 years the UK has made steady progress in eradicating football-related violence. "All genuine football fans will be concerned at last night's scenes and the police service is determined to ensure that such events remain the exception." In a statement, West Ham United Football Club said it would fully investigate the "deplorable violence" and take the strongest action against anyone involved. A Football Association spokesman said anyone found to have taken part in the violence would be banned from football for life. He said: "We absolutely condemn the disorder. "We will be working with all parties, the police and clubs, to establish the facts surrounding these events."